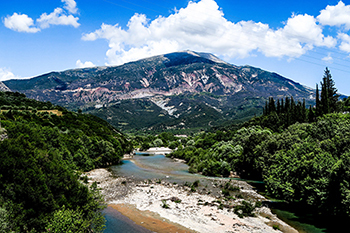 The central mountain range, the rugged Pindos mountains, form the backbone of Central Greece, an almost impassable zone some 50 miles wide, deeply dissected by winding rivers. The northern Pindos range has some of the wildest country and most striking limestone scenery found in southern Europe. This is a fascinating land that can be discovered by choosing from several itineraries. Most of the towns in Central Greece are easily located and travellers do not need a guide except for serious trekking. Near the main road from Athens to Delphi lie the southern slopes of Mount Parnassos, which towers 2457m over the Gulf of Corinth. Here the land forms a natural stone amphitheatre that houses the Sanctuary of Apollo, one of the most famous archaeological sites in Greece. 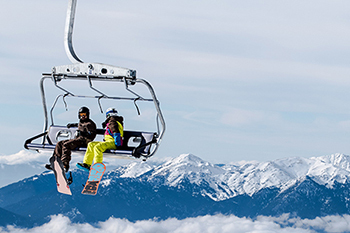 The Parnassos Ski Centre, accessible from Arahova, Amfiklia and Eftalofos, has modern ski facilities, restaurants, a first-aid centre and a ski school. Livadia, built on the foothills of Mount Helikon, was famous in ancient times for the Oracle of Trophonios Zeus and the Springs of Forgetfullness (Lethe) and Memory (Mnemosyne) to the north of the town. Delphi can be reached by road through Boeotia via Livadia and Arahova. This is the site of the famous Oracle, where rulers of ancient Greece came for many centuries for political and moral guidance. Itea, ancient Chalkion, lies on the northern coast of the Gulf of Corinth. There is an excellent beach that skirts the olive trees and a good road leads to Kira, where the remains of the ancient pier can still be seen at the bottom of the sea. 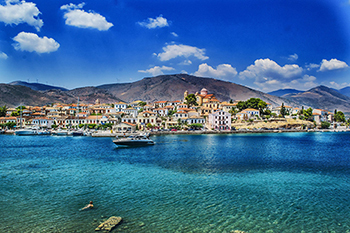 Good bathing spots in Phokida include Itea, Kira, Galaxidi, Eratini and the small islands of Trizonia and Ai-Giannis. There are a number of spa towns in Central Greece, such as Thermopiles, Kamena Vourla, Platistomo and Loutra Ypatis. West of Karpenisi (built on the foothills of Mount Timfristos at an altitude of 2438 feet above sea level) are the picturesque mountain villages of Frangista, Granitsa and Agrafa, covered with snow during the winter. Inhabited since the distant past, Central Greece is a region with a rich and distinctive past. 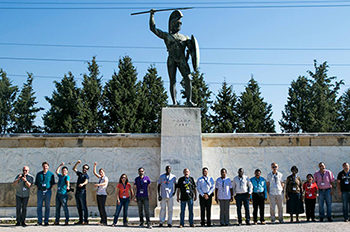 It is the land of the legendary city of Thebes, the agony of its heroes still living in the works of ancient Greece's great tragic poets, Sophocles, Aeschylus and Euripides. Mt. 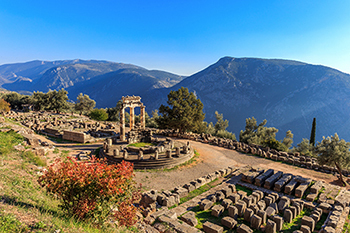 Elikonas, home of the Muses; Delphi, antiquity's most important religious centre. Farther to the north lie the unworldly rock-monasteries of Meteora. Access to these monasteries is from Kalambaka, from where the Katara pass over the Pindos Mountains brings travellers into Epirus. Famous battles were fought here, some of which affected the course of global history. Hesiodos, Pindar, Epaninondas, Pelopidas and Plutarch, all of them were sons of this land. Modern-day Central Greece also has much to offer; an abundance of natural beauty, astonishingly varied scenery and a highly developed tourist infrastructure, infinite opportunities for ideal holidays both in summer and winter. The region is divided into nine prefectures: Viotia, Fthiotida, Fokida, Larissa, Karditsa, Magnesia, Trikala, Evritania and Aetoloakarnania.